A virtual field trip is an opportunity for students to visit other places, talk to experts and participate in interactive learning activities without leaving the classroom. Dacia Jones, district science specialist at Durham Public Schools in Durham, NC, has been using virtual field trips in her classroom for 20 years. "My first year in the classroom, we took all of our kids to China by setting up our classroom as a plane, and when we got them out of the makeshift plane, they were in China, and we had passports," she said. Dacia Jones leads a class in a Skype session with NASCAR Driver James Buescher. These days, virtual field trips are more high tech, with students experiencing other places on the globe in three-dimensional virtual reality, exploring outer space or under the ocean and video chatting with experts in real time. A growing number of organizations are developing virtual field trips and supporting technology to make it easier for teachers to provide their students with these valuable learning experiences. Dacia Jones supports 30 K-5 schools, and she plans a virtual field trip for every grade, every month of the school year. Many of these trips she plans and organizes from scratch, but she also uses quite a few from Discovery Education and she recommends them to teachers who are new to virtual field trips and want to try them out for the first time. A few of Discovery Education's virtual field trips include Ford's Theatre 150: Remembering the Lincoln Assassination; Auschwitz: The Past is Present Virtual Experience; and 'Read To Discover a World of Infinite Possibilities' with President Barack Obama. Discovery Education archives all of its live events, so classes can revisit the video or watch it after the live event. 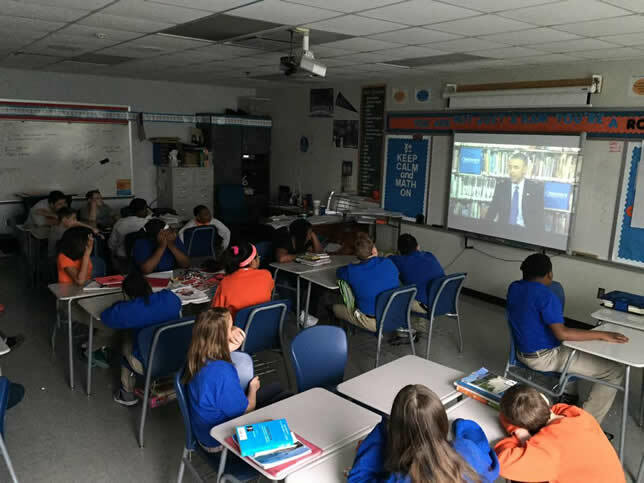 Students participate in a virtual field trip from Discovery Education featuring President Obama. Jones said she likes Discovery Education's virtual field trips because they're ready-to-use and include supporting resources for teachers. Some of Discovery's programs include a companion collection of classroom activities designed "to enhance the learning experience and help prepare students for the virtual field trip," according to information from Discovery. Jones said she makes sure the teachers in her district receive those materials, so they can use them to provide their students with some background knowledge before the field trip. If students have the opportunity to submit questions beforehand or ask them live during the broadcast, teachers work with them to prepare questions, and after the field trip is over they do some follow-up activities. "So after you click pause or stop, the learning continues," said Jones. Google Expeditions are immersive three-dimensional virtual field trips that use Google Cardboard, low-cost headsets made out of cardboard and powered by a smartphone. Saint Francis High School in Mountain View, CA was a pilot site for Google Expeditions, and teachers at the school had the opportunity to work with Google to develop some of the first virtual field trips for the platform. The Spanish class took a virtual trip to Spain, a science class did a marine biology trip and the United States history class visited historical battlefields. Hector Camacho, an economics teacher at Saint Francis High School, grappled with idea of virtual field trips for his class. "Economics is so concepts based, and a field trip isn't something that you immediately think of for economics," he said. "But when I thought about it, I realized, actually this could provide real-world context for the students." He developed a Google Expedition to the major financial centers of the United States with a focus on the 2008 financial crisis. The teachers collaborated with Google's engineers to develop those first expeditions. When the test kit arrived, it contained a classroom set of Android devices and Google Cardboard headsets, and the teachers controlled the scenes through a tablet. "When I turned it on, it took the students to the first place that I had marked for this trip, and I heard these collective oohs and aahs because it's like virtual reality," said Camacho. "You actually feel as though you're there, and when I told them to turn around, they were wondering why, but when you turn around you see that whole 360 degree view as if you were there. If you turn around, you see what's behind you; if you look up, you see the sky; if you look down, you see the floor, and it's like you're taking a physical trip to another place." Camacho used the Google Expedition to tell the story about the crumbling of the economy by going site-by-site from the New York Stock Exchange, Lehman Brothers, Goldman Sachs, Merrill Lynch and A.I.G., so students could see how some of these massive institutions had been transformed. Camacho said he thinks the experience helped his students make that real-world connection between the concept of economics and the affect they have on the day-to-day lives of ordinary people. "That's what I found so surprising, that just being in the physical place or virtually being in the place could be so impactful on their understanding of what this all means," he said. Steven Eno, an engineering and science teacher at El Segundo High School in California, had a similar experience using NASA's Eyes computer simulations to supplement his high school physics class. NASA offers numerous virtual field trips, and Eno used Eyes on the Solar System. "It allows a student to navigate throughout our solar system in three dimensions using real-time satellite data," said Eno. He introduced his students to Newton's law of universal gravitation and the forces involved in the orbits of moons around the planets and the planets around the sun. "It was a great way to give my students a feel for what's going on," said Eno. "It's hard for students to really understand what's going on with gravitation by just pulling out a book. For them to actually see what's happening with these planets and moons and how their masses differ, how their orbits differ, it really gave them a chance to see it and interact with it." Eno gave his students some questions and let them use Eyes to investigate and make some observations about gravity on their own, and then he asked them to work with Eyes in groups and consider whether the solar system is stable, if anything could cause it to become unstable and why gravity is happening in a circular motion. "Once I can get the students to see where there are some gaps in their understanding, that's when I dive into my lecture and try and fill those gaps for them," said Eno. "And so it's one of those things that it allows them to think outside the box and think like a scientist and not necessarily get to an answer but have that experience of investigating." 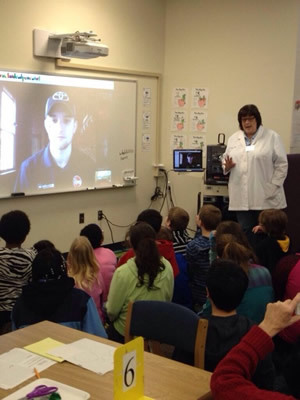 In addition to Discovery Education, Google Expeditions and NASA's Eyes, numerous other organizations offer virtual field trips of one sort or another, such as Skype in the Classroom, which lets students video chat with experts in various fields, and Scholastic, which offers video chats with authors. Kim McLean, a grade 4 teacher at Glen Hills Middle School in Glendale, WI, has used numerous virtual field trips with her class, including one from Smithsonian Education called WING-ing It: A Conversation about Flight. The Smithsonian sent McLean some supporting materials to use with her class in preparation for the field trip, and then McLean's class used the Internet to talk to experts from the National Air and Space Museum about concepts such as drag and lift and the Bernoulli Principle. A couple of weeks later, McLean received confirmation of how much her students had learned from the experience when a local librarian used a balloon to demonstrate the Bernoulli Principle to all of the grade 4 classes. When the librarian asked the students if they knew what had happened with the balloon, every one of McLean's students raised their hands and said it was Bernoulli Principle, something most of the other grade four students couldn't do. "They got so much more out of it than just my telling them about it," said McLean. "We saw it, we lived it, we did it and then it stuck. I find that kind of teaching really exciting." Both McLean and Jones have developed some of their own virtual field trips by contacting experts and setting up online video interactions with students. Jones has so much experience developing her own virtual field trips that she has even developed an online resource to help teachers set up their own. For teachers who are new to virtual field trips or who don't have the time or inclination to develop their own, Jones recommends using pre-made ones like those from Discovery Education. While virtual field trips are a great addition to classroom learning, Jones, Camacho, Eno and McLean all emphasized that they are most effective as a supplement to other learning experiences in the classroom rather than as a standalone. "Don't take a virtual field trip for the sake of a virtual field trip, make sure it has purpose and meaning for the learning as a whole," said McLean.